Imagine a healthy community as a connect-the-dots landscape painting. Each "dot" has its place and purpose: affordable housing, a vibrant economy, safe streets and public transportation, a high quality public education system, easy access to fresh food and safe recreation, and a healthcare system that provides both preventative and responsive services.The revised nonprofit hospital community benefit requirements in the federal Affordable Care Act (ACA) are an opportunity for us to help connect the dots, which are often referred to as "determinants of health." They are an impetus for healthy community design leaders and nonprofit hospitals to form partnerships that define, design and implement plans for healthy communities. 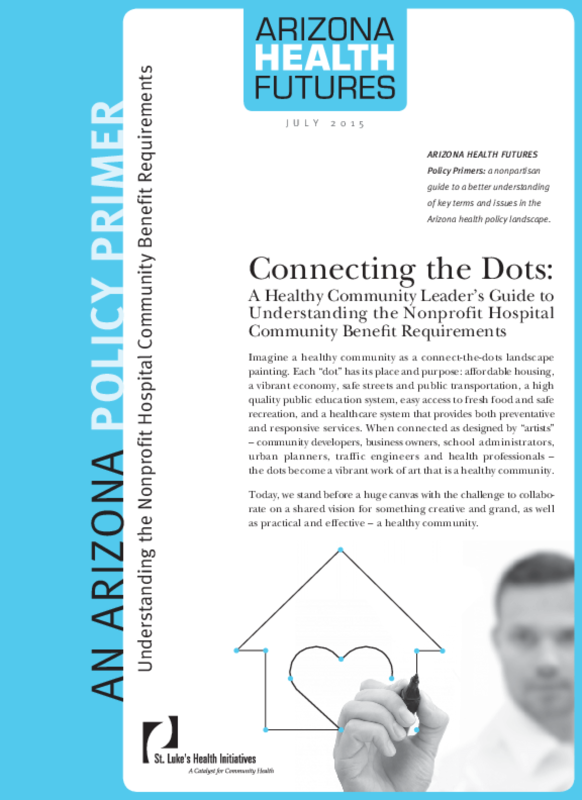 "Connecting the Dots: A Healthy Community Leader's Guide to Understanding Nonprofit Hospital Community Benefit Requirements" is a brand new Policy Primer from St. Luke's Health Initiatives that's been developed to increase understanding and create opportunities to connect Community Development with Community Benefit. It provides a guide for how Community Development leaders can begin to connect with nonprofit hospitals, building on a brief tracing of community benefit history and examination of current Community Health Needs Assessment work and hospital funding priorities. Copyright 2015 St. Luke's Health Initiatives.